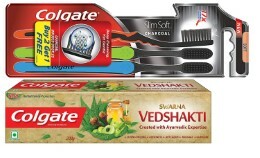 Amazon India selling Swarna Ved Shakti Toothpaste - 200 g and Colgate Slim Soft Charcoal Toothbrush (Buy 2 Get 1 Free) Rs, 181 which is worth for Rs 239 at lowest and best price . Free Shipping for Prime Users. Activate your prime account OR to get free shipping or make cart value 599 Else (Rs. 40 Shipping charge). You can follow the below steps to buy this product at their deal price.Keep Visiting dealsheaven.in for more Best offers ,hot online deals, promo code, coupons and discount . How to buy Swarna Ved Shakti Toothpaste - 200 g and Colgate Slim Soft Charcoal Toothbrush (Buy 2 Get 1 Free) ?